Excoriation disorder is an obsessive-compulsive spectrum mental disorder that is characterized by the repeated urge or impulse to pick at one's own skin to the extent that either psychological or physical damage is caused. Since the DSM-5 (2013), excoriation disorder is classified as "L98.1 Excoriation (skin-picking) disorder" in ICD-10; and is no longer classified in "Impulse control disorder" (f63)". Excoriation disorder is defined as "repetitive and compulsive picking of skin which results in tissue damage". Its most official name had been "dermatillomania" for some time. As of the release of the fifth Diagnostic and Statistical Manual of Mental Disorders in May 2013, excoriation disorder is classified as its own separate condition under "Obsessive Compulsive and Related Disorders" and is termed "excoriation (skin-picking) disorder". The inability to control the urge to pick is similar to the urge to compulsively pull one's own hair, i.e., trichotillomania. Researchers have noted the following similarities between trichotillomania and excoriation disorder: the symptoms are ritualistic but there are no preceding obsessions; there are similar triggers for the compulsive actions; both conditions appear to play a role in modifying the arousal level of the subject; and the age of onset for both conditions is similar. There is also a high level of comorbidity between those that have trichotillomania and those that have excoriation disorder. A notable difference between these conditions is that skin picking seems to be dominated by females whereas trichotillomania is more evenly distributed across genders. Research has also suggested that excoriation disorder may be thought of as a type of obsessive compulsive disorder (OCD). Excoriation disorder and OCD are similar in that they both involve "repetitive engagement in behaviors with diminished control" and also both generally decrease anxiety. There is a much greater share of females with excoriation disorder. Excoriation disorder may be inherently pleasurable whereas OCD is not. The treatments that are generally effective for patients with OCD (i. e., SSRIs and exposure therapy) are not as successful in patients with excoriation disorder. Unlike OCD, picking the skin is rarely driven by obsessive thoughts. Compulsion to engage in the negative behavior despite knowledge of the harm. Lack of control over the problematic behavior. Strong urge to engage in the behavior prior to engagement. Feeling of pleasure while engaging in the behavior or a feeling of relief or reduced anxiety after engaging in the behavior. One study that supported the addiction theory of picking found that 79% of patients with excoriation disorder reported a pleasurable feeling when picking. Odlaug and Grant also argue that dermatillomania could have several different psychological causes, which would explain why some patients seem more likely to have symptoms of OCD, and others, of an addiction. They suggest that treating certain cases of excoriation as an addiction may yield more success than treating them as a form of OCD. Compulsive picking of the knuckles (via mouth) illustrating potentially temporary disfiguration of the distal and proximal joints of the middle and little fingers. The fingers have been compulsively picked and chewed in someone with excoriation disorder and dermatophagia. Compulsive picking of face using nail pliers and tweezers. Episodes of skin picking are often preceded or accompanied by tension, anxiety, or stress. In some cases, following picking, the affected person may feel depressed. During these moments, there is commonly a compulsive urge to pick, squeeze, or scratch at a surface or region of the body, often at the location of a perceived skin defect. When picking one may feel a sense of relief or satisfaction. The region most commonly picked is the face, but other frequent locations include the arms, legs, back, gums, neck, shoulders, scalp, abdomen, chest, and extremities such as the fingernails, cuticles, and toenails. Most patients with excoriation disorder report having a primary area of the body that they focus their picking on, but they will often move to other areas of the body to allow their primary picking area to heal. Individuals with excoriation disorder vary in their picking behaviour; some do it briefly multiple times a day while others can do one picking session that can last for hours. The most common way to pick is to use the fingers although a significant minority of people use tools such as tweezers or needles. Skin picking often occurs as a result of some other triggering cause. Some common triggers are feeling or examining irregularities on the skin and feeling anxious or other negative feelings. Complications arising from excoriation disorder include: infection at the site of picking, tissue damage, and septicemia. Damage from picking can be so severe as to require skin grafting. Severe picking can cause epidermal abscesses. Severe cases of excoriation disorder can cause life-threatening injuries. For example, in one reported case a female picked a hole through the bridge of her nose, which required surgery to fix, and a 48-year-old female picked through the skin on her neck exposing the carotid artery. Pain in the neck or back can arise due to prolonged bent-over positions while engaging in the behavior. Besides physical injuries, excoriation disorder can cause severe physical scarring and disfigurement. Excoriation disorder can cause feelings of intense helplessness, guilt, shame, and embarrassment in individuals, and this greatly increases the risk of self-harm. Studies have shown that excoriation disorder presented suicidal ideation in 12% of individuals with this condition, suicide attempts in 11.5% of individuals with this condition, and psychiatric hospitalizations in 15% of individuals with this condition. There have been many different theories regarding the causes of excoriation disorder including biological and environmental factors. A common hypothesis is that excoriation disorder is often a coping mechanism to deal with elevated levels of turmoil, arousal or stress within the individual, and that the individual has an impaired stress response. A review of behavioral studies found support in this hypothesis in that skin-picking appears to be maintained by automatic reinforcement within the individual. In contrast to neurological theories, there are some psychologists who believe that picking behavior can be a result of repressed rage felt toward authoritarian parents. A similar theory holds that overbearing parents can cause the behavior to develop in their children. Clinical studies have posited that there is a strong link between traumatic childhood events and excoriation disorder. Those with self-injurious disorders of the skin are found to also frequently report childhood sexual abuse. While attempting to produce diagnostic criteria for excoriation disorder, researchers conversed with 10 patients with the disorder and found that a majority reported personal problems before the picking began, and 4 reported on abuse they suffered in childhood or adolescence. Those individuals that have excoriation disorder along with other diagnosed conditions report differing motivations for their picking. Those with both OCD and excoriation disorder report that they will pick their skin due to a perceived contamination of the skin, while those with both body dysmorphic disorder (BDD) and excoriation disorder reportedly pick to fix perceived imperfections in the skin. Studies have shown a linkage between dopamine and the urge to pick. Drugs such as cocaine and methamphetamine, which increase the pharmacological effects of dopamine, have been shown to cause uncontrollable picking in users. These drugs can create the sensation of formication, which feels like something is crawling on or under the skin. Thus, excoriation disorder could result from a dysfunction in the dopamine reward functions. There may be another neurological explanation for excoriation disorder: individuals with the condition have less motor-inhibitory control, but show no sign of difference in cognitive flexibility, when compared to individuals without the condition. Motor-inhibitory control is a function of the right lateralized frontostriatal circuit, which includes the right inferior frontal and bilateral anterior cingulate cortices. The impairment of motor-inhibitory control is similar to the neurological conditions of those who have problems suppressing inappropriate behaviors, such as abusing methamphetamine. Excoriation disorder occurs as the primary disorder and not as a subset of a larger disorder. Excoriation disorder has well-defined clinical features. There is gathering data on the clinical features and diagnostic criteria for this condition. There is sufficient data to create this as a separate category for excoriation disorder. The incidence rate for excoriation disorder is high within the population. Diagnostic criteria for the disease have already been proposed. The classification of excoriation disorder as a separate condition would lead to better studies and better treatment outcomes. Classification as a separate condition would lead to more awareness of the disorder and encourage more people to obtain treatment. Because excoriation disorder is different from other conditions and disorders that cause picking of the skin, it is important that any diagnosis of excoriation disorder take into account various other medical conditions as possible causes before diagnosing the patient with excoriation disorder. There are a variety of conditions that cause itching and skin picking including: eczema, psoriasis, diabetes, liver disease, Hodgkin's disease, polycythemia vera, systemic lupus, and Prader-Willi syndrome. In order to better understand excoriation disorder, researchers have developed a variety of scales to categorize skin-picking behavior. These include the Skin-Picking Impact Scale (SPIS), and The Milwaukee Inventory for the Dimensions of Adult Skin-picking. The SPIS was created to measure how skin picking affects the individual socially, behaviorally, and emotionally. Knowledge about effective treatments for excoriation disorder is sparse, despite the prevalence of the condition. There are two major classes of therapy for excoriation disorder: pharmacological and behavioral. Individuals with excoriation disorder often do not seek treatment for their condition, largely due to feelings of embarrassment, alienation, lack of awareness, or belief that the condition cannot be treated. 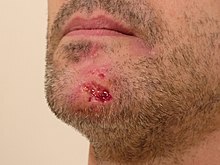 One study found that only 45% of individuals with excoriation disorder ever sought treatment, and only 19% ever received dermalogical treatment. Another study found that only 30% of individuals with this disorder sought treatment. There are several different classes of pharmacological treatment agents that have some support for treating excoriation disorder: SSRIs; opioid antagonists; and glutamatergic agents. In addition to these classes of drugs, some other pharmacological products have been tested in small trials as well. Antipsychotic, antianxiety, antidepressant, and antiepileptic medications have all been used to treat skin picking, with varying degrees of success. SSRIs have shown to be effective in the treatment of OCD, which serves as an argument in favor of treating excoriation disorder with the same therapy. Unfortunately, clinical studies have not provided clear support for this, because there have not been large double-blind placebo-controlled trials of SSRI therapy for excoriation disorder. In fact, in a meta-analysis of pharmacological treatments of excoriation disorders, it was found that selective serotonin reuptake inhibitors (SSRIs) and lamotrigine were no more effective than a placebo for longterm effects. Reviews of treatment of excoriation disorder have shown that the following medications may be effective in reducing picking behavior: doxepin, clomipramine, naltrexone, pimozide, and olanzapine. Small studies of fluoxetine, an SSRI, in treating excoriation disorder showed that the drug reduced certain aspects of skin picking compared with a placebo, but full remission was not observed. One small study of patients with excoriation disorder treated with citalopram, another SSRI, showed that those who took the drug significantly reduced their scores on the Yale-Brown Obsessive Compulsive Scale compared with a placebo, but that there was no significant decrease on the visual-analog scale of picking behavior. While there have been no human studies of opioid antagonists for the treatment of excoriation disorder, there have been studies showing that these products can reduce self-chewing in dogs with acral lick, which some have proposed is a good animal model for body-focused repetitive behavior. Furthermore, case reports support the use of these opioid antagonists to treat excoriation disorder. Opioid antagonists work by affecting dopamine circuitry, thereby decreasing the pleasurable effects of picking. Another class of possible pharmacological treatments are glutamatergic agents such as n-acetyl cysteine (NAC). These products have shown some ability to reduce other problematic behaviors such as cocaine addiction and trichotillomania. Some case studies and some small studies of NAC have shown a decrease in picking by treatment with NAC compared with placebo. Excoriation disorder and trichotillomania have been treated with inositol. Topiramate, an anti-epileptic drug, has been used to treat excoriation disorder; in a small study of individuals with Prader–Willi syndrome, it was found to reduce skin picking. Behavioral treatments include habit reversal training, cognitive-behavioral therapy, acceptance-enhanced behavior therapy and acceptance and commitment therapy (ACT). Several studies have shown that habit reversal training associated with awareness training reduces skin-picking behavior in those individuals with excoriation disorder that do not have psychological disabilities. Habit reversal training can include awareness enhancement and competing response training. For example, in one study the competing response training required participants to make a closed fist for one minute instead of picking or in response to a condition that usually provokes picking behavior. There are several different behavioral interventions that have been tested to treat excoriation disorder in the developmentally disabled. One method is to have individuals wear a form of protective clothing that limits the ability of the patient to pick at his body, e.g., gloves or face mask. Other behavioral treatments attempt to change behavior through providing different incentives. Under Differential Reinforcement of Other Behavior (DRO), a patient is rewarded if able to abstain from the picking behavior for a certain amount of time. In contrast to DRO, Differential Reinforcement of Incompatible Behavior (DRI) rewards an individual for engaging in an alternative behavior that cannot physically occur at the same time as the problem behavior (e.g. sitting on your hands instead of picking at your skin). Lastly, differential reinforcement of alternative behavior rewards behavior that is not necessarily incompatible with the target behavior but serves the same function as the target behavior (e.g., providing people with a competing behavior to occupy their time instead of skin picking). All of these techniques have been reported to have some success in small studies, but none has been tested in large enough populations to provide definitive evidence of their effectiveness. Tentative evidence suggests that devices that provide feedback when the activity occurs can be useful. The prevalence of excoriation disorder is not well understood. Estimates of prevalence of the condition range from 1.4 to 5.4% in the general population. One U.S. telephone survey found that 16.6% of respondents "picked their skin to the point of noticeable tissue damage" and that 1.4% would qualify as meeting the requirements of excoriation disorder. Another community survey found a rate of 5.4% had excoriation disorder. A survey of college students found a rate of 4%. One study found that among non-disabled adults, 63% of individuals engaged in some form of skin picking and 5.4% engaged in serious skin picking. Lastly, a survey of dermatology patients found that 2% suffered from excoriation disorder. In some patients excoriation disorder begins with the onset of acne in adolescence, but the compulsion continues even after the acne has gone away. Skin conditions such as keratosis pilaris, psoriasis, and eczema can also provoke the behavior. In patients with acne, the grooming of the skin is disproportionate to the severity of the acne. Certain stressful events including marital conflicts, deaths of friends or family, and unwanted pregnancies have been linked to the onset of the condition. If excoriation disorder does not occur during adolescence another common age of onset is between the ages of 30 to 45. Additionally, many cases of excoriation disorder have been documented to begin in children under the age of 10. One small survey of patients with excoriation disorder found that 47.5% of them had an early onset of excoriation disorder that began before age 10. Traumatic childhood events may initiate the behavior. Excoriation disorder is statistically more common in females than in males. Excoriation disorder has a high rate of comorbidity with other psychiatric conditions, especially with mood and anxiety disorders . One survey of patients with excoriation disorder found that 56.7% also had a DSM-IV Axis-I disorder and 38% had alcohol- or drug-abuse problems. Studies have shown the following rates of psychiatric conditions found in patients with excoriation disorder: trichotillomania (38.3%), substance abuse (38%), major depressive disorder (approximately 31.7% to 58.1%), anxiety disorders (approximately 23% to 56%), obsessive-compulsive disorder (approximately 16.7% to 68%), and body dysmorphic disorder (approximately 26.8% to 44.9%). There are also higher rates of excoriation disorder in patients in psychiatric facilities; a study of adolescent psychiatric inpatients found that excoriation disorder was present in 11.8% of patients. It is also present at high rates with some other conditions: 44.9% of patients with body dysmorphic disorder also have excoriation disorder; 8.9% of patients with OCD have excoriation disorder; and 8.3% of patients with trichotillomania have excoriation disorder. Skin picking is also common in those with certain developmental disabilities; for example, Prader–Willi syndrome and Smith–Magenis syndrome. Studies have shown that 85% of people with Prader–Willi syndrome also engage in skin-picking. Children with developmental disabilities are also at an increased risk for excoriation disorder. Excoriation disorder also correlates with "social, occupational, and academic impairments, increased medical and mental health concerns (including anxiety, depression, obsessive–compulsive disorder) ... and financial burden". Excoriation disorder also has a high degree of comorbidity with occupational and marital difficulties. Substance abuse is often present, and individuals with excoriation disorder are twice as likely to have first-degree relatives who have substance abuse disorders than those without the condition. Some cases of body-focused repetitive behaviors found in identical twins also suggest a hereditary factor. The first known mention of excoriation disorder in the print can be found in 1898 by the French dermatologist Louis-Anne-Jean Brocq, describing an adolescent female patient who had uncontrolled picking of acne. Excoriation disorder has been the subject of several episodes of Obsessed, a television documentary series that focuses on treatment of anxiety disorders. Excoriation disorder is shown as a symptom of Nina Sayers' anxiety and OCD in the movie Black Swan. ^ The term derives from the Greek: δέρμα derma ("skin"), τίλλειν tillein ("to pull"), and μανία mania ("madness, frenzy"). ^ Feusner JD, Hembacher E, Phillips KA (September 2009). "The mouse who couldn't stop washing: pathologic grooming in animals and humans". CNS Spectrums. 14 (9): 503–13. PMC 2853748. PMID 19890232. ^ a b c d e f g h i j k l m n o p q r s t u v w x y z aa ab ac ad ae af ag ah ai aj ak al am an ao ap aq ar as at au av Odlaug BL, Grant JE (September 2010). "Pathologic skin picking". The American Journal of Drug and Alcohol Abuse. 36 (5): 296–303. doi:10.3109/00952991003747543. PMID 20575652. ^ Deckersbach, Thilo; Wilhelm, Sabine; Keuthen, Nancy J.; Baer, Lee; Jenike, Michael A. (July 1, 2002). "Cognitive-Behavior Therapy for Self-Injurious Skin Picking". Behavior Modification. 26 (3): 361–377. doi:10.1177/0145445502026003004. ISSN 0145-4455. PMID 12080906. ^ a b c d e f g h i Stein DJ, Grant JE, Franklin ME, Keuthen N, Lochner C, Singer HS, Woods DW (June 2010). "Trichotillomania (hair pulling disorder), skin picking disorder, and stereotypic movement disorder: toward DSM-V". Depression and Anxiety. 27 (6): 611–26. doi:10.1002/da.20700. PMID 20533371. ^ a b c d e * Dell'Osso B, Altamura AC, Allen A, Marazziti D, Hollander E (December 2006). "Epidemiologic and clinical updates on impulse control disorders: a critical review". European Archives of Psychiatry and Clinical Neuroscience. 256 (8): 464–75. doi:10.1007/s00406-006-0668-0. PMC 1705499. PMID 16960655. ^ a b c d e f g h i j k l m n o p q r s t u Lang R, Didden R, Machalicek W, Rispoli M, Sigafoos J, Lancioni G, Mulloy A, Regester A, Pierce N, Kang S (2010). "Behavioral treatment of chronic skin-picking in individuals with developmental disabilities: a systematic review". Research in Developmental Disabilities. 31 (2): 304–15. doi:10.1016/j.ridd.2009.10.017. PMID 19963341. ^ Causes of Skin Picking, including biological and environmental factors. ^ Yalçin M, Tellioğlu E, Yildirim DU, Savrun BM, Özmen M, Aydemir EH (December 2015). "Psychiatric Features in Neurotic Excoriation Patients: The Role of Childhood Trauma". Noro Psikiyatri Arsivi. 52 (4): 336–341. doi:10.5152/npa.2015.9902. PMC 5353104. PMID 28360736. ^ a b Monzani, Benedetta; Rijsdijk, Fruhling; Cherkas, Lynn; Harris, Juliette; Keuthen, Nancy; Mataix-Cols, David (2012-05-22). "Prevalence and heritability of skin picking in an adult community sample: A twin study". American Journal of Medical Genetics Part B: Neuropsychiatric Genetics. 159B (5): 605–610. doi:10.1002/ajmg.b.32067. ISSN 1552-4841. ^ Keuthen NJ, Deckersbach T, Wilhelm S, Engelhard I, Forker A, O'Sullivan RL, Jenike MA, Baer L (2001). "The Skin Picking Impact Scale (SPIS): scale development and psychometric analyses". Psychosomatics. 42 (5): 397–403. doi:10.1176/appi.psy.42.5.397. PMID 11739906. Archived from the original on 2012-07-12. Retrieved 2011-10-01. ^ "Excoriation Disorder: Practice Essentials, Background, Pathophysiology and Etiology". 2018-07-10. ^ "Excoriation Disorder: Practice Essentials, Background, Pathophysiology and Etiology". emedicine.medscape.com. 2018-07-10. Retrieved 2018-12-01. ^ Schumer, Maya C.; Bartley, Christine A.; Bloch, Michael H. (April 2016). "Systematic Review of Pharmacological and Behavioral Treatments for Skin Picking Disorder". Journal of Clinical Psychopharmacology. 36 (2): 147–152. doi:10.1097/JCP.0000000000000462. ISSN 0271-0749. PMC 4930073. PMID 26872117. ^ Torales J, Barrios I, Villalba J (2017). "Alternative Therapies for Excoriation (Skin Picking) Disorder: A Brief Update". Advances in Mind-Body Medicine. 31 (1): 10–13. PMID 28183072. ^ Craig-Müller, Sören; Reichenberg, Jason (July 4, 2015). "The Other Itch That Rashes: a Clinical and Therapeutic Approach to Pruritus and Skin Picking Disorders". Allergic Skin Diseases. ^ Monzani, Benedetta; Rijsdijk, Fruhling; Cherkas, Lynn; Harris, Juliette; Keuthen, Nancy; Mataix-Cols, David (2012-05-22). "Prevalence and heritability of skin picking in an adult community sample: A twin study". American Journal of Medical Genetics Part B: Neuropsychiatric Genetics. 159B (5): 605–610. doi:10.1002/ajmg.b.32067. ISSN 1552-4841. PMID 22619132. ^ Brocq ML (1898). "L'acne excoriee des jeunes filles et son traitement. (Acne excoriee of young women and their treatment)". Journal des Practiciens, Revue Generale de Clinique et de Therapeutique. 12: 193–197. Grant JE, Odlaug BL (August 2009). "Update on pathological skin picking". Current Psychiatry Reports. 11 (4): 283–8. doi:10.1007/s11920-009-0041-x. PMID 19635236. Singer HS (2011). Stereotypic movement disorders. Handbook of Clinical Neurology. 100. pp. 631–9. doi:10.1016/B978-0-444-52014-2.00045-8. ISBN 9780444520142. PMID 21496612. Stein DJ, Grant JE, Franklin ME, Keuthen N, Lochner C, Singer HS, Woods DW (June 2010). "Trichotillomania (hair pulling disorder), skin picking disorder, and stereotypic movement disorder: toward DSM-V". Depression and Anxiety. 27 (6): 611–26. doi:10.1002/da.20700. PMID 20533371. Stratton M (February 2018). "Stop Picking On Me". This page was last edited on 30 March 2019, at 14:15 (UTC).